If the Pixies and the Black Lips got drunk at a party and then had a relationship that spawned a musical child it just might sound like The Lovely Bad Things. Anchored in heavy bass, thick drum lines and post punk guitar strains, their music not only provides fuel for mosh pits but implants catchy garage rock melodies in your brain. The Lovely Bad Things were born in October of 2009 sparked by a random cryptic text message. Details of what was said are sketchy at best but Camron and Brayden Ward, Lauren Curtius and Tim Hatch (who had all been playing music with one another for years) practically turned into a band without even trying. The natural inseparability and accord among the four-piece is exuded in their dynamic live performance and often translates into playing each others instruments when they feel like it, all sharing in the lead vocals and blending musical genres at will. Acting as a tribe with one cohesive goal in mind, the four are compelled to play as many shows as they can, anywhere and everywhere they can. If there wasn't a place to play, they would create the venue themselves, performing and hosting other bands at their rehearsal space (aka The Lovely Bad Pad) where beer stained walls contain the sound ghosts of many bands including Audacity, Crystal Antlers, Dikes of Holland, Ice Age and Peter, Bjorn and John. Deeply embedded in the DIY scene they have gained a devoted fan base and have shared the stage (or lack thereof) with such noteworthy acts as The Thermals, Bare Wires, Screaming Females, OFF!, Wavves, No Age, Crystal Antlers, Jacuzzi Boys, The Growlers, Abe Vigoda, Bleached and Peter, Bjorn and John. 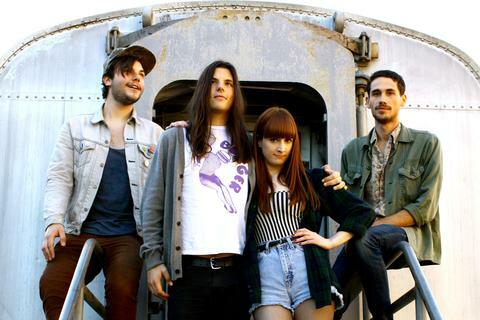 Late in 2010 they released their first full length entitled "Shark Week" on cassette (UVR) and their second release, an EP entitled "New Ghosts/Old Waves" was released in July 2011 on cassette with Burger Records. In November of 2011 they signed with Volcom Entertainment and will be releasing their EP on vinyl in March of 2012.